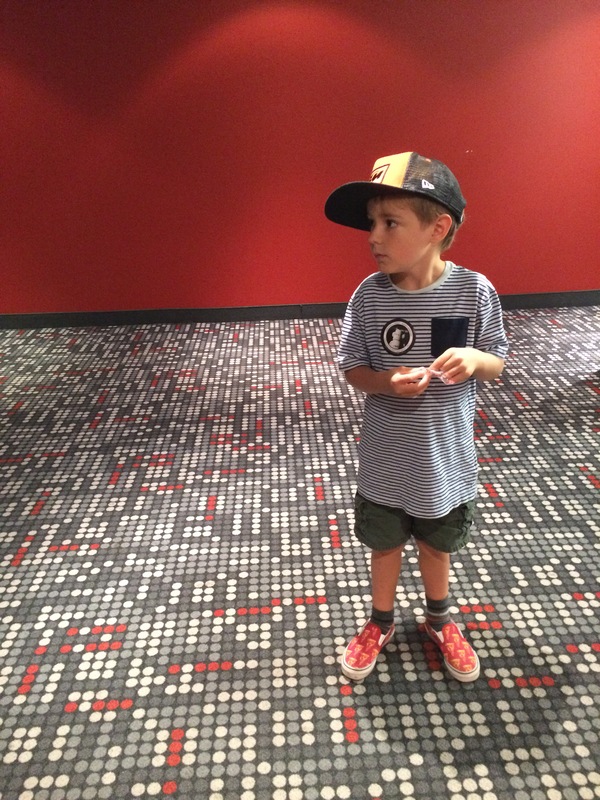 Yesterday I went to Place des Arts to see Kid Koala’s (I know I’m old, I seriously recall him playing shows while he was underage…is this possible?) 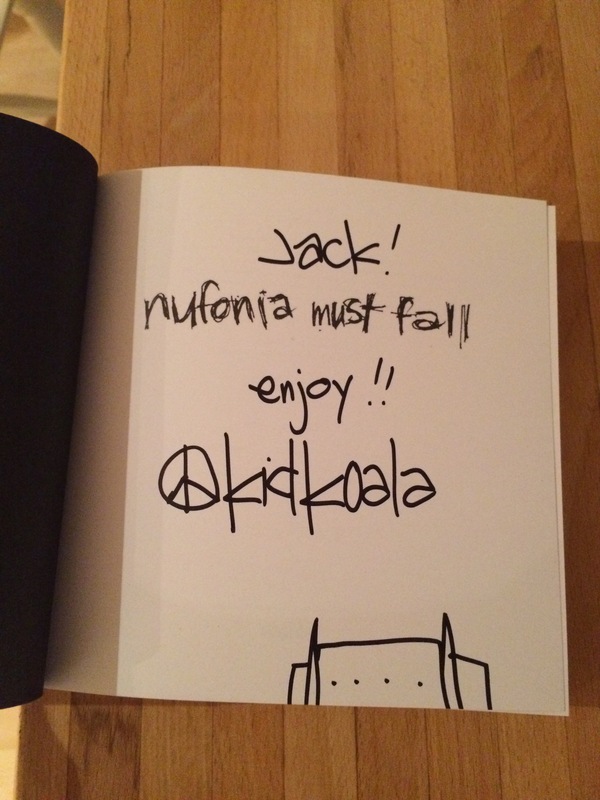 Nufonia Must Fall with Jack. The show is absolutely a feast. The logistics behind the set up is complex yet somehow comes across as very simple. A dj in the corner, tiny puppet sets all over the place, puppeteers moving from set to set, followed by cameras, and each scene is projected behind the stage on a huge screen. The stage direction …sublime. And of course, the string quartet whose musicians, along with Kid Koala’s dj/percussion/’vocals’/etc stylings strung together the many emotions contained in the piece. Jack kept kissing my hand, thanking me for bringing him. He felt the emotion throughout the piece, yelling them out as he felt them (sorry fellow audience members!). That’s not fair! This is scary, mommy. Oh, he loves her! Look, it’s the airport! This is so cool! And then we went outside Place des Arts where the streets are still closed to cars for a few more days and saw the huge chess games set up. Jack wanted to play. The wait for a turn was too long. and headed home early. To be delayed by a) a holdup at the gas station (for real) and b) Kanye West fans spilling out of the Bell Centre. The police blocked access to practically every street. I finally got home and Jack was still up and had to join me while driving Sebastien home… So it was a late night for both of us. And all I had at home was ground pork and a cauliflower… The beginnings of the calamity appeared for a few moments when he sat on the road and refused to move when I said we couldn’t stay. Somehow I convinced him to walk with me (yes, we’ll be playing chess, no matter how long the wait, after kung fu later today) to the car, get in, and drive to the grocery store. I have a long standing rule. If you walk away from me in a store and I need to spend more energy looking for you than shopping, we leave the cart where it is and go home. I’ve had to follow through with that rule only once before, about 2 years ago. Well, I should have done the shopping earlier in the day when he had more of a chance of sticking near me in the store. Needless to say, the cart was left next to the eggs, and I walked out holding a screeching little boy by the hand. We are not leaving, mommy! No! Turn around! The soundtrack skipped on that track until we got home. It looked something like this by the time we got to our driveway. So he played chess on his own (he won) while I made the last of our food into dinner and then we ate it while watching The Lego Movie and finished our day dancing to Everything is Awesome (I know it now, Kelly!) before heading to bed, the two of us, before 8pm. It turns out you don’t need eggs for meatloaf to work. What better way to start the year than with a bowl of noodle soup? Noodle soup for New Year has been with me since I lived in Korea some, holy crap, 20 years ago. Jack tolerated soup for breakfast but somehow he is not a fan (his words) of soup. Here is the evidence. Where did this little creature come from? I can eat soup for every meal. before heading out to see Peter Pan at the Hudson Village Theatre where Jack had an awesome time yelling boooooo at the pirates and clapping for Tinkerbell but I had an even better time realizing that I was watching my old, old friend (from even before that 20 yr old sojourn in Korea…yeah, old) John Sheridan performing on stage! What a flipping treat! Jack is pretty much in love with him because he let him play on the stage after the show and even brought him backstage, mommy! Somehow I did not take a picture of the two of them…which would have been an even bigger treat since John was dressed in shimmery blues and silvers and purples as King Neptune. But I did get a picture of Jack and this thing outside of the theatre. Then what did we do? We went home, ate duck and soup (you can guess who had the duck and who had the soup…), and went for a walk to make sure that the little boy slept a good night, just in case the up until midnight on New Year’s Eve and the excitement of Peter Pan just wasn’t enough. And now… Now I have a very rare 24 hrs to myself and I am spending some of it thinking about our first few moments of the New Year. Good food. Good play. Old friends. Time outside. I’ve been working full-time since November and it has definitely been a challenge. The biggest one being finding that quality time to spend with Jack just playing. Tonight’s supper allowed us to play in the backyard while it cooked… for the most part. Awesome. And there are leftovers. Even better. Put fiddleheads on plates with chicken, squeeze some lemon juice, forgetting about the paper cut for a brief moment. ouch. When the rare moment comes along, the one where I can prolong it to an hour or more by myself and actually lie down on the couch, I try to take it. Really I do. Especially now when I should probably be putting my foot up way more often than I do. And how wonderful when that moment comes along on a hot afternoon that still manages to be enveloped in a cool breeze. The thing is, on a hot afternoon one needs to keep the windows open to catch that cool breeze lest one poaches oneself mid-nap. Really, how is one to nap through this? …I’m nursing a foot injury that I thought would be better by now. The heat has to do with how it happened. I went to open the back door of my decidedly un-climate-controlled house and had to give it a little push since the humidity was holding it close to the door frame. The window in the door, the very old and thin window in the door, broke into shards and fell around me and into me. Blood. 911. Ambulance. ER. Stitches. Bandages. And now, 2 days shy of 3 weeks later, my foot is still healing and I’m coming to realize I may have a bit of a deeper injury. So the heat brought me some bad luck but, as the doctor said, ‘j’étais chanceuse dans ma malchance’ (I was lucky in my bad luck). The glass could have found another part of me. But, more importantly, Jack was in his highchair. Jack. Was. In. His. Highchair. That window was obviously going to break soon. I am so relieved it broke when and how it did. Good thing for that heat. 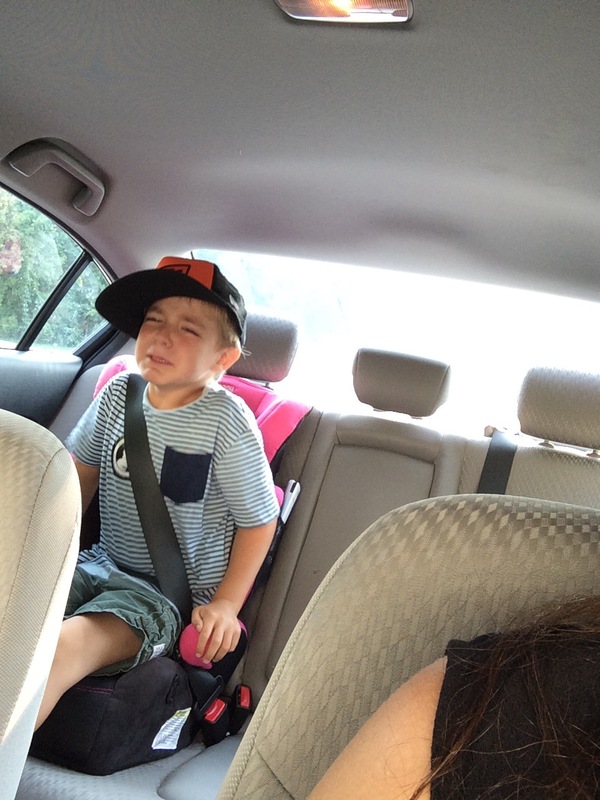 My niece and nephew have been in town for a month and their mother, my sister, came to join them for the past week. As always, the time sped by way too quickly – especially now that we both have kids to race around after there is hardly any time to actually talk between cleaning mud off of dirty boys (they found and emptied my mud buckets…) and protecting kids from barking dogs (not my kid, if he weren’t used to it by now…) and … and …. Ah well. So yesterday my sister and her kids came over for lunch…what was I going to make? You see, to be blunt, they like sweet and salty processed foods – like much of the rest of North America – and Jack and I don’t eat that way. Hot dogs and cakes would be super easy to make unwrap and warm up but that just doesn’t float my boat so I decided bbq chicken was the way to go. I marinated the pieces of chicken in a mixture of…. 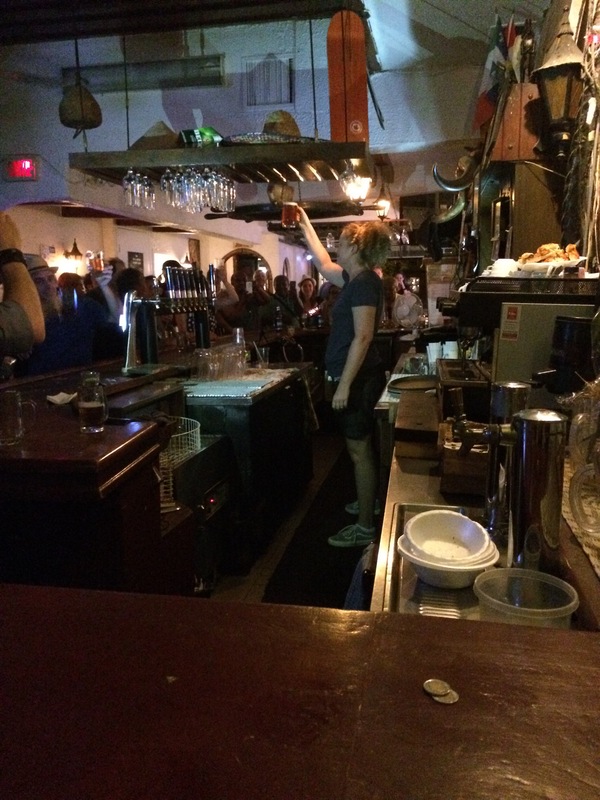 …a few shots, maybe closer to 6, of Franks Red Hot Sauce. I think that was it. I made sure the chicken pieces were soaked and coated and then let it sit, covered in the fridge, for 4 hours. The plan was to barbecue them but something happened and my darn barbecue just wouldn’t start (no clicky, clicky noise at all when we pushed the starter) so we oven roasted them for about 45 minutes. Mmmmm. Mmmmm. I made tons, thinking we’d have loads of leftovers, and we have 3 small pieces left. The olive oil crisped up the skin, the spices gave it some gorgeous colour, and the maple syrup made it nice and sweet for my sister’s family’s tastes and made me feel better about having sweet food for mine. For dessert there were mango ice thingies on a stick, made only of mango. So we had a yummy picnic treat with food I felt good about serving. This is what underlies how I strive to raise Jack. That we should eat well and love each other. Why those two things in particular? Because I believe that without those two things we are at a disadvantage but with them we are fortified to face anything, including changing the world we live in. It’s hard to make change with an empty stomach and an empty heart. It goes beyond our little family of two. Not only should we eat well and love each other but it’s something we should share with others. For example, eating well. Oh boy, that’s a charged statement. Eating well leads to being well and it is much more than filling our stomachs. Jack is lucky, lucky, lucky. He lives in an area with easy access to fresh, local food. And he lives with a mother who can afford to refuse to feed him fast food. Though sometimes I fantasize about just throwing some sliced cheese between two slices of bread or making mac and cheese or driving up to a drive-thru window because it would be so easy. Especially on those evenings where I forgot to defrost some meat or I know that I need to pick up some food before I can even think of what to make. But then I throw open the fridge door and I find what to make – even if it is just a fried egg with some fruit on the side. I don’t give in to the ease of processed food because of my next point. Eating well has so much to do with loving each other. We eat together at the kitchen table twice a day every day. When I am not working, it is 3 times a day. I make all of our food. Except for the yogourt (we eat goat yogourt) and the prosciutto or bacon. Even then, I am careful to choose meat that has a minimum of ingredients. The prosciutto has 3 – pork, salt, pepper. The bacon is brined and then smoked. People (mainly my mother and sister) make fun of me for being so picky about what I choose to feed Jack and myself but I believe it is the right thing to do. Jack loves the food I give him. He stuffs himself with it. He laughs and asks for cinnamon to add flavour to his yogourt. By the time I get my plate ready and sit down for dinner he looks at me with his greasy little hands and cheeks and yodels, “Encore meat!” “Encore sweet potato!” “Encore papaya!” We have a good time when we eat and I love that I know what is going in that little body of his when we eat together. I know that my mother gives him toast when he is there at breakfast time and his other grandmother gives him ice cream cones and it creeps me out but what can I do? The only thing I can do is let it go and remind myself that if he is at their houses then they are taking care of him and giving me some help. Yes, Jack plays with my iPad. We like to look through the pictures in my camera roll together, watch little music videos, and play a few games. A few months ago I downloaded an app that I thought would be fun for Jack. He loves it and interacts with it like crazy! It’s called Endless ABC by Callaway Digital Arts. It is free. Here is a screenshot. It’s basically a series of interactive flash cards that show words and explode their letters over the screen. You drag them back to where they go and they make silly letter sounds as you drag them. Once you put the word back together there is a celebration and then a cute video with little monster creatures that illustrates the word. Jack started off by playing one of the words, ‘flop’, over and over again. How many times could I listen to feu, feu, feu, feu? I asked myself… Soon after he started playing that game I saw him finding Fs all over the place. From the car, we’d be stopped in traffic near signs with Fs and he’d shriek feu, feu, feu, feu! Then, when he tried out other words it started to happen with Ns and then other letters. When he plays Endless ABC he’s constantly making sounds – repeating the words, the letter sounds, and calling out to the creatures in the videos. Now, at 2 1/2, he absolutely loves letters, their sounds, and their names. When he sees words he scans them for the ones he knows and delights in pointing them out to me and making their sounds. I know that the game plays a large roll in this. I also know that it is but one aspect. It’s a wonderful tool within a family culture of reading. What else do I do to support reading? When we put on clothing with words on them, we look for the ones we know. Jack was so excited when he found the F on this shirt! His crib is filled with books and before any sleep time, he reads a book to me. Ok. Maybe more than one. Sometimes I read to him, sometimes we read to each other. When we get in the truck, we look for the letters on the dashboard. He first pointed out the FF on the CD player and it grew from there. His grandfather bought him an alphabet puzzle on a recent trip and we play it together often. He sits with me when I read my books, sometimes digitally, sometimes on paper, and he watches. And he says, ‘mommy book’. Our house is covered with books. His and mine. We celebrate letters, words, and books. When a book gets torn I become ‘mommy book doctor’ and he watches while I tape it back together. So learning to read and to celebrate reading is so much more than an app or a phonics program and Endless ABC is definitely a fun addition to our family reading culture. I go into child pose. Jack drives his little cars all over my back. Little boy gets to play with his mommy.